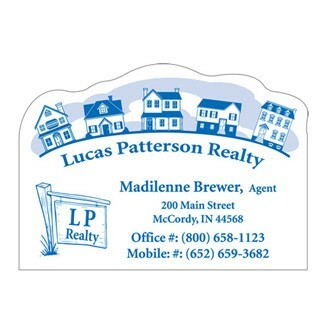 Make your magnet really stand out with our Creative Top Magnets. Choose from a variety of shapes and stock layouts, seen to the left. Great for restaurants, dentists, realtors, and teachers! Adds a distinctive touch to any logo or message. PMS Color Match : $15.00(V) 30 Mil Offset Only. Standard ink colors available at no charge. 20 Mil Magnets printed in full color, no additional charge. Size : Approximately 3.5" x 2.5"